Armenians value much dairy products, part of their daily meals. 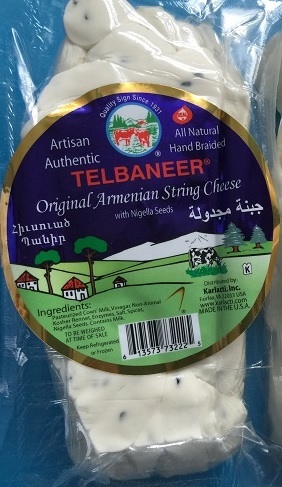 TELBANEER Original Armenian string cheese is made from 100% whole cow's milk and seasoned with mahleb, nigella seeds and a pinch of salt. The natural, handmade original braided string cheese is a delicious and exotic ethnic delicacy, flavored with black nigella seeds, which give it a rich subtle taste. The Mediterranean original braided string cheese is called Majdouleh or Majdouli by Middle Eastern people. String TELBANEER original braided string cheese before serving it to family and friends as a lovely pile of strings! TELBANEER handcrafted original braided string cheeses are produced in a HACCP certified facility which ensures constant cheese quality and safety. It is the original braided string cheese without the nigella seeds. KARLACTI natural handmade Mediterranean braided string cheeses have a mild taste and a pure white color. A great snack and perfect to melt, TELBANEER original braided string cheeses are also used as a table cheese and for cooking. TELBANEER handcrafted braided Armenian String Cheeses are produced in a HACCP certified facility which ensures constant cheese quality and safety.